BANGI, 30 Nov, 2012 – The National University of Malaysia (UKM) may be able to save up to RM 9 Million a year in electricity bills if it implements energy efficiency strategies which are affordable. 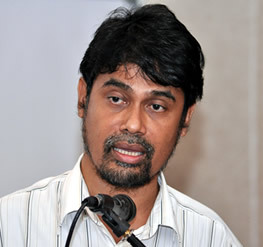 Institute of Solar Energy Research (SERI) Director, Professor Dr Kamaruzzaman Sopian said a team investigating energy-saving measures found that the UKM Medical Centre (PPUKM) in Cheras, Kuala Lumpur and the Chancellery Building in Bangi are the two biggest energy drains that can be substantially improved if certain measures are implemented. 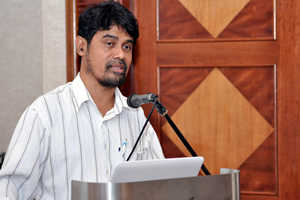 Prof Kamaruzzaman said the study indicated a possible decrease of up to 30% of the Building Energy Index (BEI) or RM5 million in energy savings if renewable strategies such as lowering the air-conditioning levels and using solar energy. The BEI indicates the specific energy usage of a building. It is basically the ratio of total energy used to the total built-up area. This total energy use includes both purchased electricity as well as that generated on-site but excludes renewable sources like solar photovoltaic and others. Speaking to UKM News Portal at the sidelines of the Seminar and Workshop of a Sustainable UKM Campus in Bangi, he said using insulation and Polyvinyl Chloride (PV) and installation of thermal panels may save an additional RM4 million annually. Prof Kamaruzzaman, who led the six-person team that did a field survey and simulation study on the main campus and the PPUKM, said objective and subjective measurements were carried out to assess the thermal conditions in terms of human comfort. The indication was that the Chancellery building should be able to manage at up to 26 degrees Celcius, which is the recommended level by the government. Temperatures measured at the Chancellery were much lower. These show that the neutrality temperature did not comply with world standards and the environment was found to be “slightly cool”, he added. The simulation model used in the study corresponded closely with the actual field study. The studies in the two buildings provide UKM with a great opportunity in reducing energy consumption through green energy while providing better indoor air quality towards sustainability. Prof Kamaruzzaman proposed that Solar Thermal Systems be used at the medical centre, which are more sustainable compared to using electricity alone. He said there is enough open space outside the hospital to install the panels, sufficient to reduce the heating bill of the hospital by between 30 to 40% compared to using just natural gas, the cost of which is rising fast. He said that while design of the Chancellery building may be impressive, there are a lot of empty spaces that become heat reservoirs, requiring the air-conditioning to be turned up. The biggest energy-waster is the foyer or the main entrance hall with its cavernous space extending upwards and backwards. For most of the time the foyer, despite its huge space, has very few people in it , even if there are exhibitions held there. As a result the hall becomes very cold to the few people who must sit or stand in there for extended periods such as the security guards and receptionists. He said even the more crowded offices in the Chancellery had become too cold for some people to the point that they brought along jackets and scarves. The objective is for a comfortable, rather than a cold workplace as spelt out by international guidelines. His solution is simply to turn down the central air-conditioning and allow the temperature to rise by a few degree celcius which will still be cooler than the outside environment. Apart from that, insulation can be installed in some of the offices where heat leakages were detected. Nevertheless he believes that the best and simplest move of turning down the air-condition is something that can be done immediately. Prof Kamaruzzaman had submitted a report on the matter to the Vice-Chancellor’s office following a directive from Prof Tan Sri Dato’ Wira Dr Sharifah Hapsah Syed Hasan Shahabudin recently. Prof Kamaruzzaman obtained his Bachelor of Science in Mechanical Engineering at the University of Wisconsin-Madison in the United States in 1985. He completed his Masters of Science in Energy Resources at the School of Engineering, University of Pittsburgh, Pennsylvania in 1989. He recieved his PhD in Solar Technology at the Department of Mechanical Engineering, University of Miami Coral Gables in Florida in 1997. His field of of specialization is Solar Energy Technology, Fuel Cell Technology and Energy related studies. Prof Kamaruzzaman explained that sustainability is a long-term attitude towards environmental protection and the investment to implement the measures will be well worth it.